O JESUS, I firmly believe that Thou art present within me as God and Man, enrich my soul with graces and to fill my heart with the happiness of the blessed. I believe that Thou art Christ, the Son of the Living God! WITH DEEPEST HUMILITY, I adore Thee, my Lord and my God. Thou hast made my soul Thy dwelling place. I adore Thee as my Creator from Whose hands I came and with Whom I am to be happy forever. DEAR JESUS, I love Thee with my whole heart, with my whole soul, and with all my strength. May the love of Thine own Sacred Heart fill my soul and purify it, so that I may die to the world for love of Thee, as Thou didst die on the Cross for love of me. My God, Thou art all mine; grant that I may be all Thine now and forever! FROM THE DEPTHS of my heart I thank Thee, dear Lord, for Thine infinite kindness in coming to me. How good Thou art to me! With Thy most holy Mother and all the Angels and Saints, I praise Thy mercy and generosity toward me, a poor sinner. I thank Thee for nourishing my soul with Thy Sacred Body and Precious Blood. I will try to show my gratitude to Thee in the Sacrament of Thy Love by obedience to Thy holy Commandments, by fidelity to my duties, by kindness to my neighbor and by an earnest endeavor to be more like Thee in my daily conduct. O Jesus, Thou hast given Thyself to me; now let me give myself to Thee. I give Thee my body, that it may be chaste and pure. I give Thee my soul, that it may be free from sin. I give Thee my heart, that it may always love Thee. I give Thee every thought, word and deed of my life, and I offer all for Thine honor and glory. O JESUS, since Thou hast come to me to grant me graces, bidding me to ask with confidence, permit me to ask for some special favors. Grant me also a full pardon and remission of the guilt of all my sins, which I once more detest with all my heart, and remit the temporal punishment which is due for them. Detach my heart from all created things; fashion it after Thine own Most Sacred Heart; and unite it forever to Thyself in the bonds of perfect love. O Jesus, help me in time of temptation. May I lead a good life and die a happy death. May I receive Thee before I die. 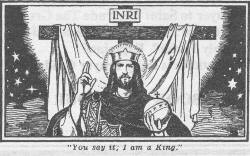 O CHRIST JESUS, I acknowledge Thee to be the King of the universe; all that has been made was created for Thee. Exercise over me all Thy sovereign rights. I hereby renew the promises of my Baptism, renouncing Satan and all his works and pomps, and I engage myself to lead henceforth a trulyChristian Ufe. And in a special manner do I undertake, so far as in me lies, to bring about the triumph of the rights of God and Thy Church. O Divine Heart of Jesus, I offer Thee my poor actions to obtain the acknowledgment by every heart of Thy sacred kingly power. Thus may the kingdom of Thy peace be firmly established throughout all the earth. Amen. A plenary indulgence once daily is attached, with Confession, Communion, a visit to a Catholic church and prayer for the Holy Father's intentions being also required. (272). Ne'er to be parted from Thy side. "You say it, I am a King"